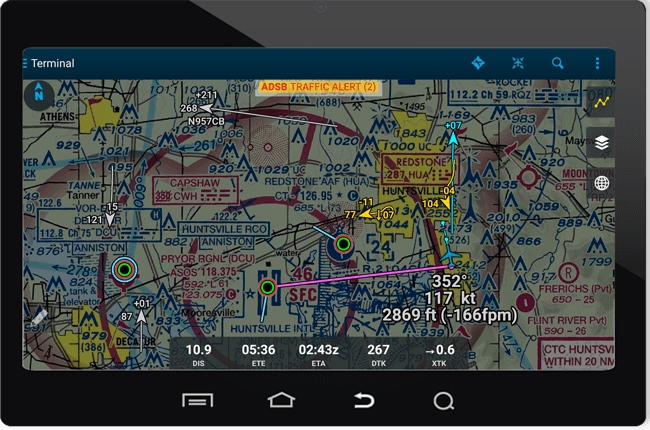 DroidEFB, the leading aviation in-flight navigation and support app for Android devices, announced a new version of their product, now offering support for ADS-B receivers based on the Stratux open source software project . DroidEFB provides pilots with real-time situational awareness via a GPS moving map integrated with both VFR and IFR aviation charts. The newest integration with Stratux provides the cost effective Automatic Dependent Surveillance – Broadcast (ADS–B) solution that so many pilots have been requesting. Most solutions on the market are very expensive, which is why the free Stratux software integration in this version of DroidEFB is so important. DroidEFB Version 2.1.1 is now available for download from the company’s website or from the Google Play app store. “Our user base has been asking for integration with the Stratux ADS-B receiver and with this update we are happy to be able to fulfill this request with our enhanced DroidEFB Aviation Navigation app,” said company CTO, Mark Spencer. “Besides the Stratux ADS-B integration, we addressed some minor bug fixes that resulted from Google’s latest update of Android, demonstrating our continued commitment to provide a robust and stable navigation platform for our pilot customers,” continued Mark. With this important upgrade announcement in supporting Stratux software, the company is also attending Florida’s largest annual convention, SUN ‘n FUN International-Fly In and Expo April 5th– 10th. They will be displaying in partnership with both Stratux and FlightBox, an ADS-B receiver built from off-the-shelf hardware that utilizes Stratux software. Interested users can further explore the app and associated components utilizing real time data and find hands on experts at the booth. The company invites you to join them at booth’s N-058, N-059, N-064, N-065.